The Lithuanian Investment Index is developed by INVL Asset Management, one of the country’s leading asset management firms. It shows how returns on investments in the country’s four main asset classes have evolved since 1995. 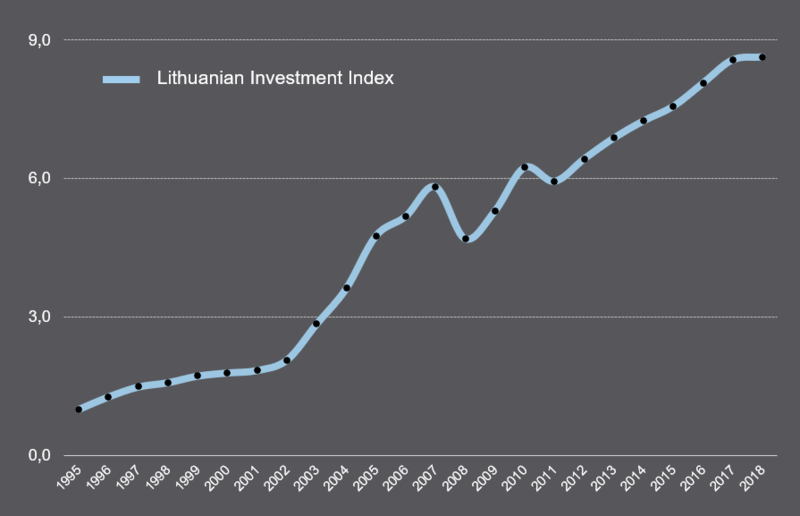 According to the index, the average return on investments in Lithuania in 2009–2018 was 6.3 per cent. For the period 1996–2018, meanwhile, the figure was 9.8 per cent, confirming the benefits of long-term investments. In 2018, the return on the Lithuanian Investment Index was 0.7 per cent, and investments in rental housing stood out with a gain of 8.1 per cent. Meanwhile, the return on investments in stocks in the country was negative (-5.6 per cent). Inflation in 2018 was 2.5 per cent and was higher than the return of long-term Lithuanian bonds (0.3 per cent) and deposits (gave no return). 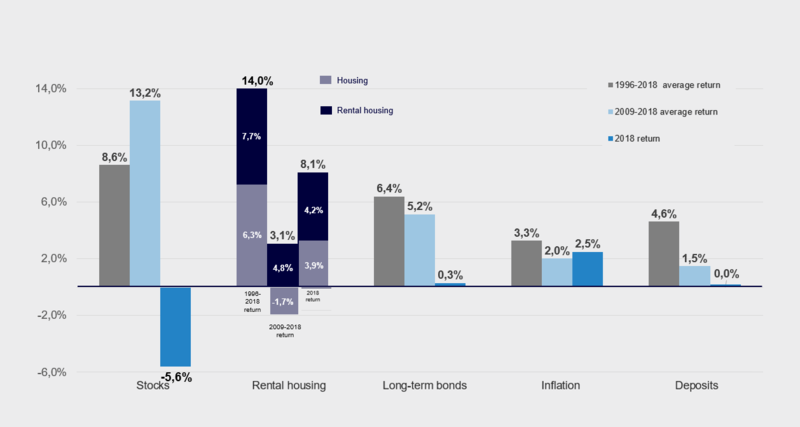 The investment return on rental housing in Lithuania has varied greatly: the average return over the period 1996-2018 was 14.0%, while for 2009-2018 it was 3.1%. The return on Lithuanian stocks in 2018 was negative, at -5.6%, but exceeded the return on European and global stocks. It was also larger over the last 10 years (2009-2018), when it was 13.2%, and over the last 23 years (1996-2018), when it was 8.6%. Pension funds from their inception in 2004 through the end of 2018 earned a 4.2% average annual return. For 2009-2018 that return was 5.4% and exceeded not only inflation, but also the return on the country’s long-term bonds, deposits, and rental housing. Looking at the performance of safe investments –long-term bonds– in Lithuania, from 1996 to 2018 their return was 6.4%, while in 2009-2018 it was 5.2%, and in 2018 it was just 0.3%. The return on deposits in Lithuania in 2018 was zero, as it has been for the last four years. In 1996-2018 the return on deposits was 4.6%, while in 2009-2018 it was 1.5%. Individual asset classes yield different returns in different periods, so to reduce risk and sustain investment gains, spreading investments over a variety of areas is recommended. * Since creation in 2004. More information can be found in the INVL Asset Management press release. The Lithuanian Investment Index is an initiative of INVL Asset Management. Any use of the data herein must identify INVL Asset Management as the source.